← How Much Horse Power do You Need? Anytime a business or homeowner needs to change pipes or plumbing, hiring a Master Plumber is a good idea. In addition to being an expert in the field of plumbing, they also know and understand what types of jobs require permits. A licensed Master Plumber can help to get the permit in place before any work is done, making sure the business or homeowner is following all the local rules and regulations. This is important so that no one has to pay any fines for being in violation. Gas piping is a little different than tradition pipes plumbers might work on. Since gas is so highly flammable, it’s important to know exactly what you’re doing. Changing gas pipes requires knowledge about how certain pipe sizes work, and how important it is to get the right amount of gas to the appliance or fireplace in order for it to work properly and be safe. Pipes for a house versus a business may need different sizes based on different needs, and a qualified plumber will know exactly what pipe to use. Before working, they will locate the on/off valve for the gas, and turn it off before starting any work. Since gas piping has specific sizing needs, plumbers who are qualified to work on them are able to cut any pipes they need to size, and they also know the correct joints to use. They will properly test the gas to make sure it is working properly before turning it back on and leaving the site. 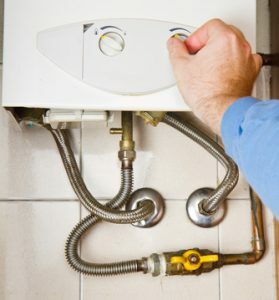 Plumbers also understand that if you own a business, you need to get back to work quickly. Homeowners also want to get back to what they’re doing, so the plumber will finish the job as fast as he can while adhering to all safety rules and regulations. There are a variety of reasons a home or business owner may want gas pipes installed. Backyard grills and fire pits can use gas and be a great addition to any home. Many people who enjoy cooking only like to work on a gas kitchen range. This is because a gas range not only cooks faster, but the heat is distributed more evenly, making a gas range a high priority for serious cooks. Other household appliances such as washing machines, dryers, refrigerators, water heaters, and tankless water heaters can come set up for using gas. This is often because in certain parts of the country, gas is less expensive than electricity. Gas fireplaces are also popular in many new homes, even those in areas where they may not get used much, such as here in Melbourne, Florida. When you’re ready to install a new appliance or feature that requires gas piping, make sure to call a professional licensed plumber. They can get the job done safely and quickly, allowing you to enjoy your new appliance as quickly as possible after purchase.